Wesley Chess Cafe located at 4th Level Robinsons Imus will be hosting the BW-GETS Team Try-Outs for the 2012 National Inter-Barangay Tournament. BW-GETS stands for Barangay Wesley So (BW) and GM Eugene Torre Supporters (GETS). The BW-GETS Team Try-Outs is scheduled to take place on June 30, 2012 (Saturday) starting 10:00am and will introduce a new, interesting and unique format i.e. According to the organizer BW’s Supremo MORPHYEUS, the try-outs is open to “BW-GETS World” (Local and International BW-GETS members), although for those living abroad are not eligible to win prizes. Local players could join and play at the venue or could join along with the International players via the internet. The Top 10 players (plus alternates) are eligible to qualify for the National Inter-Barangay whose schedule still to be determined. 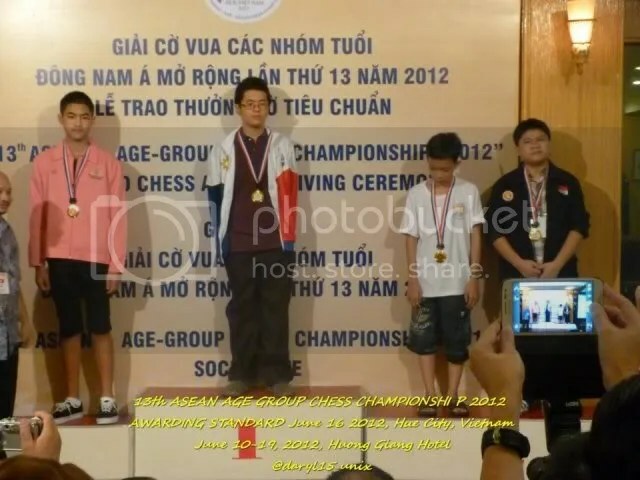 BW-GETS member FM Paulo Bersamina, the most bemedaled Philippines player in the just concluded 13th ASEAN+ Age Group Chess Championships in Vietnam, with six(6) medals [ 2-Gold (U14-Standard, U14-Rapid), 3-Silver (U14Team-Standard, U14Team-Rapid, U14Team-Blitz) and 1-Bronze U14-Blitz] has already confirmed his participation. Additionally, the event was also envisioned to support 14-year old FM Paulo Bersamina’s quest for the GM title. Entry fees from Internet players plus donations will go directly to Paulo’s account. Co-organizer pinoymaster77 had developed means on how to send support/donations on this regard. If interested to join (and/or send your donation to FM Paulo Bersamina) the Tournament please visit Wesley So Page at chessgames.com and signify your intention. Do you have a future date for this event yet?